It is crazy hot, here in NYC, but of course, I’m loving every sticky minute of it!В I’m still forgoing fans or an AC in my apartment, but I’ve been indulging in lots of ice showers—my indoor version of what those kids are doing in the photo above. 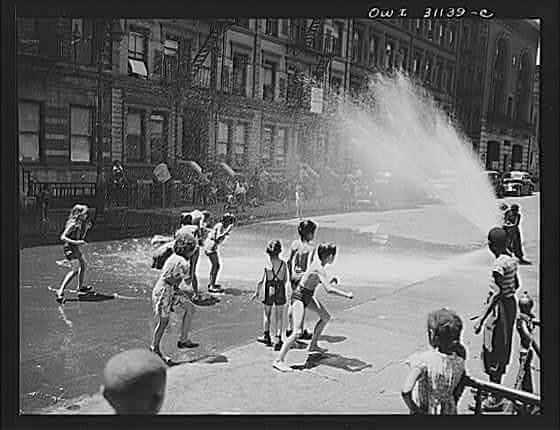 Maybe because it’s so old school, but I love that cooling off via fire hydrant is an NYC tradition.В (This photo was taken in 1943.) Today, local fire departments even distribute free “spray caps” for hydrants, to save water and create makeshift sprinklers for anyone looking for heat relief.